It's been a fine year for top-notch Android flagships, and here we're going to compare two of the very best handsets of the year: the Google Pixel 3 XL and the Huawei Mate 20. If you're after a large phone powered by Google's OS, these should be on your shortlist. But which phone is going to suit you best? We've put them head-to-head in categories like design, software, specs and features to break down where the similarities and differences are. Here's everything you need to know about the Pixel 3 XL vs the Huawei Mate 20 Pro. What strikes you first about these phones is their size. The Google Pixel 3 XL comes rocking a 6.3-inch, 1,440 x 2,960 pixel display (523 pixels-per-inch), while the Huawei Mate 20 Pro has a 6.39-inch, 1,440 x 3,120 pixel display (583 ppi). The Google phone is a shade thinner (7.9 mm vs 8.6 mm) and a shade lighter (184 grams vs 189 grams). Both phones make use of OLED displays and both phones make use of a notch at the top – but we have to give Huawei the win here for a notch integration that looks a lot more classy. The Google Pixel 3 XL notch is deep and chunky, and really eats into the screen. The Pixel 3 XL has a thicker bottom chin on the front display as well. Around the back it's a different story – we actually prefer the two-tone, textured approach of the Google Pixel 3 XL. It's more minimal and stylish than the back of the Huawei Mate 20 Pro, in our eyes at least, which has a three-lens camera setup that looks a little overwhelming. Neither phone really knocks it out of the park in terms of design though. The Google Pixel 3 XL is powered by the Snapdragon 845 processor from Qualcomm, which in benchmarks is usually edged out by the Huawei Kirin 980 chip that's inside the Mate 20 Pro. The difference isn't huge, and both phones run speedily and smoothly, but in terms of raw power and power efficiency this is another win for Huawei. That extends to the RAM as well – there's 6GB or 8GB of it in the Mate 20 Pro, depending on which option you go for, and just 4GB of it in the Pixel 3 XL. Huawei gives you 128GB or 256GB of internal storage, expandable via memory card, whereas Google offers only 64GB or 128GB, and no option to extend that with a card. One of the big selling points of a Pixel phone is Google's Pixel Android OS: slick, lean and with all the latest features, it includes excellent Google Assistant integration. Huawei's EMUI take on Android is fine, but it's not as good. Both phones start on Android 9 Pie, though Google's phones will of of course get newer updates faster, as we've come to expect from the Pixel handsets. The camera is another area where the Google Pixel 3 XL excels. It has just a single-lens, 12.2MP camera on the rear, compared with the triple-lens 40MP+20MP+8MP snapper of the Huawei Mate 20 Pro – but thanks to Google's excellent image processing algorithms and expertise, it's the Pixel that actually takes the better photos most of the time. Both phones score very highly in this area though. Both the Google Pixel 3 XL and the Huawei Mate 20 Pro have IP68 dust and waterproofing, and both can be charged wirelessly, should you want to take advantage of that. One other feature worth mentioning – the Mate 20 Pro has a fingerprint sensor actually under the front display, whereas on the Google Pixel 3 XL it's still around the back. If you want the fastest phone possible, and the biggest screen, and the most attractively designed front-facing notch, then the Huawei Mate 20 Pro is the handset you should probably opt for. It's right up there as one of Huawei's best smartphones yet, and you certainly won't be disappointed in any department. For the best software experience, the tightest integration with Google's other services, and – perhaps – the best results from your mobile photos, the Google Pixel 3 XL looks like a more attractive option bet. This year's Pixel phones are better than ever, though that notch does put us off a bit (remember you can opt for the Pixel 3 if you want a smaller screen and no notch). 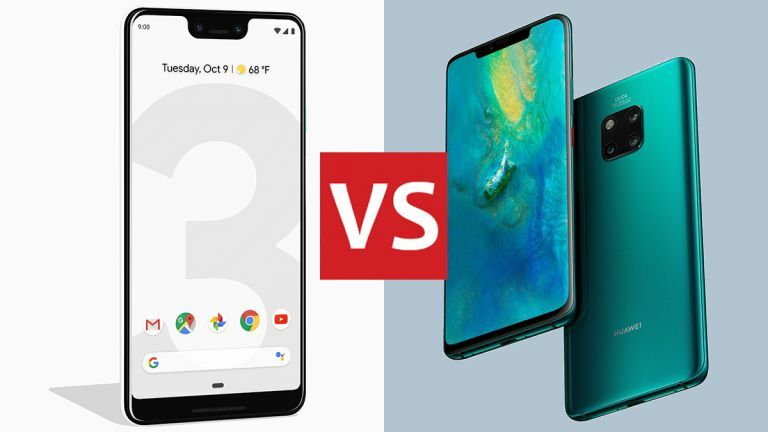 This is one of those comparisons where there's not really much to choose between the two handsets – they both excel in most areas of design and performance, with just a few niggles worth mentioning to separate them. The phones also point towards a bright future for devices from Huawei and Google, and we're looking forward to what both companies are going to come up with in 2019.